Darke County Center for the Arts will present guitarist/singer/songwriter Diana Chittester at The Coffee Pot in downtown Greenville on April 25, the final presentation of DCCA’s 2018-19 Coffeehouse Series season. 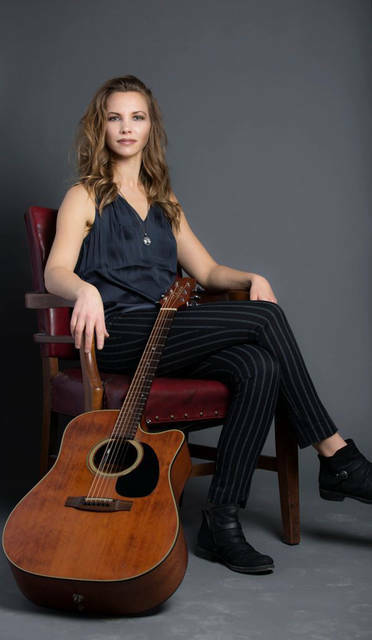 GREENVILLE – Darke County Center for the Arts will present guitarist/singer/songwriter Diana Chittester at The Coffee Pot in downtown Greenville on April 25. The final presentation of DCCA’s 2018-19 Coffeehouse Series season, the show starts at 7 p.m. The Cleveland-based artist has been described as “kinda folk with a funky punk edge” and compared to singer/songwriters Joni Mitchell and Ani DeFranco. According to Rawlins, Chittester developed her signature guitar style by imitating a three-piece band while touring as a solo performer. “Her unique sound utilizing percussive thumping, popping bass lines and melodic picking patterns garnered attention, enhancing her stature as she gained acclaim around the country,” Rawlins said. DCCA’s Coffeehouse Series, which presents artists performing in an inviting social setting where food and drink also are available, is sponsored by Rodney Oda, Steve and Eileen Litchfield and The Andersons. Additionally, the Ohio Arts Council helps fund this program with state tax dollars to encourage economic growth, educational excellence and cultural enrichment for all Ohioans. DCCA also receives operating support from the Harry D. and Esther Stephens Memorial as well as funding from the Ketrow Foundation, Lydia E. Schaurer Memorial Trust Fund and the John R. and Miriam H. Knick Fund of Darke County Foundation. DCCA membership contributions also help support this series. Tickets for this concert by Diana Chittester are $10 and can be purchased by contacting the DCCA Office at 937-547-0908 or dcca@darkecountyarts.org; tickets also are available at The Coffee Pot, online at www.darkecountyarts.org and will be sold at the door if any remain by showtime.